'We're cruising not vacationing.' I set my cup on the saucer. I'd need to remember that. I know where Jim is going with this. We'd spent extra days in Annapolis. The days and evenings with Scotty Robinson were not to be missed. There were no regrets but we had expected to be farther down the Bay. Norfolk, Virginia was our intended destination by the end of the month. We'd sit till Novenber 1st, the official end of hurricane season, before entering the Intracoastal Waterway. I finish coiling the dock lines and stow them in the lazarette as we motor out of Back Creek into the Severn River and on out into the Bay. Jim still looks way too serious for such a beautiful day. As usual he's thinking ahead while I'm enjoying the shoreline drift by beneath a bright October sun. We delayed further conversation. The wind had come up. In minutes we'd run the sheets through the blocks before securing them around the winches as we hauled out the head sail to run downwind at a steady six and a half knots. 'It's a good omen,' I shout over the whoosh of water sliding past the Damn Yankee's hull. Jim is finally smiling as he bends to rotate the winch handle to tweak another tenth of a knot from the sail set. We're on our way! Jim's pronouncement is not unexpected. 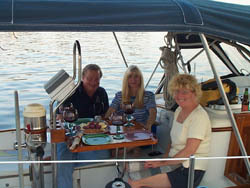 Between the lure of Annapolis restaurants and the captivity of the boat show we'd eaten on board only two nights. The freezer bulged with meat. We'd purchased the ultimate pressure cooker and here we sat in Herrington Harbor South, at a table by the window, devouring the prime rib special. 'You're right,' I agree sipping my coffee. 'We're cruising not vacationing.' I set my cup on the saucer. I'd need to remember that. Life on the Damn Yankee thus far had consisted of vacations or a few long week-ends spent rafted up with friends grilling and chilling. And dining out was a requisite pleasure of boating.Somewhere between we would find an agreeable balance. Enough of restaurant food, we'd begin tomorrow. Friday dawned gradually warming us to the same sun bright intensity of Thursday but without the bonus of a ten knot wind to push us that extra knot. So, we motored down the Bay alone but for the two motor yachts that left us rolling in their wakes. We traveled beyond the rivers leading to Knapps Narrows and Tighlman Island, on past the Tred Avon where Cambridge and Oxford lay. We were gliding past memories of well-spent leisure time. I breath in the watery smell in the warm air and try to hold the moment a little longer. The Damn Yankee swept into the Patuxent River. Zahniser's pristine gray buildings beckoned from the distance. She surged forward over the wake of an outgoing trawler. Now buoyant in familiar waters she was edging closer to the foreign. For a few days though, she would be pampered. And Jim and I would enjoy some down time. It doesn't take much to relax in the Solomon's. Zahniser's diligently maintained surroundings encourages calm. I smiled hearing the clink of latch on a white picket gate as it closed behind us as we headed for the office. Funny, I hadn't heard that sound in years. The warm, easy smile of welcome from Chrissy at check in along with Jim Starkey's assurance that the work on the Damn Yankee was scheduled released us to revel in a day or two of indulgent diversion. Within an hour of arrival, Jim and I were pedaling along the main road up toward Washburn's to pick up produce for dinner aboard. The road stretched ahead; the dull ache in my legs reminded me to exercise more. After returning the bikes, we promised ourselves to reclaim them for a day of exploring. First, we both needed to complete our boat chores. An overflowing bag of laundry was dispensed quickly with the use of two washers and dryers. If one was so inclined, one could luxuriate in a steaming tub simultaneously. I opted for a bucket of Mr. Clean and vacuuming until the clothes and the boat were spotless. Then I indulged. Pure decadent enjoyment; I grinned through the spray of hot water, limitless enough to shave my legs and rinse my hair. A leisurely stroll down Zahniser's main dock where we paused to admire the classic beauty of a forty-four foot Mason netted us an invitation for drinks and hors d'oeuvres aboard the Esprit Du Vent. She was certainly a boat to fulfill a dream from her polished navy hull to the luxurious use of teak below. Jim hurried back to the Damn Yankee's wine locker while Ron set up the cockpit table and I helped Diane unpack new wine goblets purchased just that afternoon. In minutes the wine was uncorked and poured. Diane set out an array of cheese, crackers and the roundest best tasting purple grapes I've ever had. We toasted and traded tales through a spectacular fall sunset. The evening lengthened. It was full dark before we made our way back to the Damn Yankee with me clutching a bowl full of grapes from Diane for Jim and me to share. The sun rose Monday on another mild sunny day. For the Damn Yankee, she would experience 'life on the hard.' We watched as like anxious parents as she was gently hauled from the water and lifted onto rigid metal stands. First a pressure wash then a wax and buff and finally new bottom paint. She'd fairly dance down the Bay. My heart clutched to see her cradled while her bow remained pointed south. High above the parking lot she stood, resolute. I was proud of her. One final glance over my shoulder and I turned my bike to follow Jim out of the parking lot. As a kid, I rode my bike everywhere. I'd forgotten how child-happy I could be perched on the seat of an old borrowed bicycle with a wire basket. Down C Street to the main drag, I took a left turn to follow the straightway past antique shops set up in Victorian houses fronted by long sweeping porches. I pumped up and around the twists and turns from gravel to concrete that comprise the town's outskirts, on out to Charles St. I breezed along the waterfront gaping left and right at the beauty of lawns and red brick. 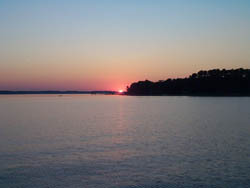 Always just beyond lay the Chesapeake, Her waters extending in an endless radius to disappear over the horizon. How could I have forgotten one of life's simplest joys? I had no pat answer. I suspect it's a combination of years and age. Well, I'd make it up by savoring the feeling of freedom today. I pedaled faster to catch more breeze. 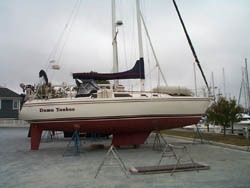 Back at Zahniser's, the paint was drying on the Damn Yankee's hull. She'd be put back into the water tomorrow. As for Jim and I, the painters had left a convenient ladder. Why it's called 'life on the hard escapes me.' I understand the concept. Even the logic is clear. Everyone but me sees sense somewhere between the words 'on' and 'hard.' I don't, preferring to focus on the more apt word choices of 'in' and 'mid-air,' because that was the reality of the evening. We would climb a ladder propped against the Damn Yankee's hull and haul ourselves into the cockpit maybe enjoy a glass of wine from our unique vantage point before heading below to sleep undisturbed in the middle of Zahniser's parking lot. There's nautical irony there, I'm sure. Drizzle and soupy fog greeted our departure morning. Nonetheless we pulled on sweats and our new foul weather jackets and slipped the lines. We were back in the Bay before eight thirty, our hands wrapped around steaming mugs of coffee eager to venture into new territory. We'd planned a few days at the Tides Lodge but elected to pass this trip. We'd spent far too many days in marinas. It was time to put some miles under the Damn Yankee's keel. The radar chart plotter negated the guesswork associated with navigating in the fog. We decided to keep going beyond the Pappahannock River. The Tides Lodge could wait for the return trip in the spring. We debated about stopping as we sailed past first Reedville and then Deltaville along Virginia's western shore. We were flying and too exhilarated to stop! With her clean bottom, the Damn Yankee maxed out under a steady wind at around seven two. We should have quit while we were ahead because after a full out ten hours we decided to enjoy the following day on the hook doing a little reading and enjoying the beautiful scenery we were too tired to appreciate after the anchor was down the night before. The weather report warned of twenty-five to thirty knot winds and the associated gusts along with the front. We were happy enough to stay put in the Piankatank River at a special place called Fishing Bay. Tucked secure and rocking gently deep within the half-moon crescent that comprises the anchorage along with half a dozen other sailboats, we became for that day, a piece of a landscape as old as the Bay. It was at once both awesome and humbling.